We truly looked for years for the right wedding ring. We were looking for something untraditional and found a great selection of both untraditional and traditional rings at TSimon. Tracy was patient and amazing to work with on our many visits. After the purchase, making adjustments for sizing and fit was a breeze with Tricia. Highly recommend. Also felt great to buy local! Thank you Tracy and Tricia! Just about dropped dead when he opened the box... that is the best way i can explain it!! Happily engaged! Be PROUD Tricia and Tracy!! Fantastic job on my ring! It's stunning!! They did an amazing job with my engagement ring and the service is unbelievable! Tricia and Tracy ALWAYS give the best service on jewelry and will always work within your price range. The most beautiful jewelry in Door County! five stars... Love everything about this place!! Selection, imagination, quality, knowledge, talent, helpful associates. 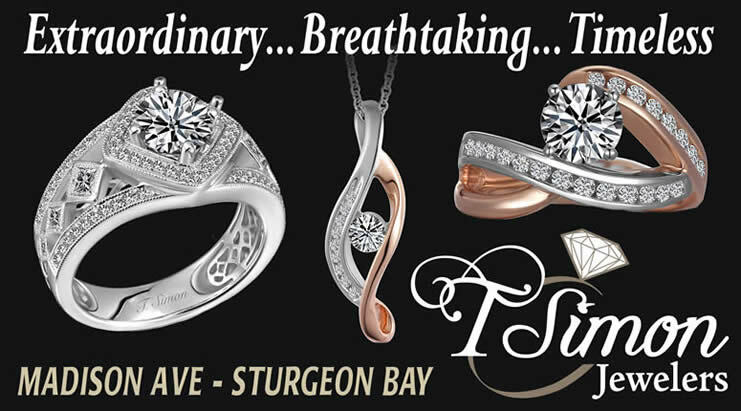 For fine jewelry, there isn't a place in Door county who can offer anything better! Tricia did a great job at personalizing our choice of rings, she determined our preferences and went out of her way to find just the right settings and then helped me pick out the perfect stone. Tricia made adjustments to the setting to make the ring be truly "one of a kind". Her customer service was really outstanding; loved her attention to detail; our vision and her creativity helped make our special moment one we will remember forever. Whether it’s repairs, in the store merchandise or custom jewelry orders. I turn to T. Simon jewelers. The girls are truly some of Door County’s real "gems"
Thank you so much for helping us pick out our rings. I would also like to thank you for helping Jason pick out a very pretty necklace and earrings he gave me as a wedding gift. This is a testimonial to the superb quality of the services and products provided to me and my family through the years, during which we have done business. I was particularly and most recently pleased with Mrs. Jorns and the staff went who way beyond the “call of duty” in providing Mrs. Lambert and me with and extraordinary and beautiful anniversary ring on the occasion of our 50th anniversary. The challenges for you included not only consulting on the design of the ring. Also completing much of the purchase transaction through a third party and by electronic mail and telephone calls; not an easy task when I was 1800 miles away much of the time! And the timing had to be the exquisite, as the presentation of the ring “had” to be on a date and at a time certain, literally on the banks of the thames in London. With your vital help, we pulled it off! I have to suppose that this is an example of the sort of products and services which are routinely provided by you and your employees. I say that because over the years we have experienced similar outstanding results with other fine jewelry purchases from your firm made on behalf of our children, grandchildren and ourselves. I would like to thank the design team at T. Simon jewelers for helping me to create my late husband and my wedding bands into an incredibly beautiful slide. Which now keeps my husband close to my heart. I love it and it will remain in my family for many generations to come!! I have been a T Simon customer since first moving to Door County in July 2007. The selection of fine jewelry and sterling silver is outstanding. I wear T. simon collections almost daily and get compliments every single time. I have a range of simple, yet elegant pieces as well as the large and bold. Due to the quality of jewelry at T. Simon jewelers, I will be a life long customer. Thanks to Tricia, Tracy and Pat for providing such elegance and charm. I've have been going to T. Simon jewelers for all my jewelry needs for years and I've never been disappointed! Between the quality of the pieces I've purchased and the service before and after the sale, they have a customer for life in me!!! Thanks for all you do! Please email your testimonials and we would be happy to post them on our website!